All-Star Purple Party is a special concert celebrating the birthday of Prince, one of the greatest musical artists of our time. This concert features outstanding lead singer Junie Henderson performing as Prince with dazzling vocals, iconic attire and commanding stage presence that captures the spirit of Prince’s electrifying performances. 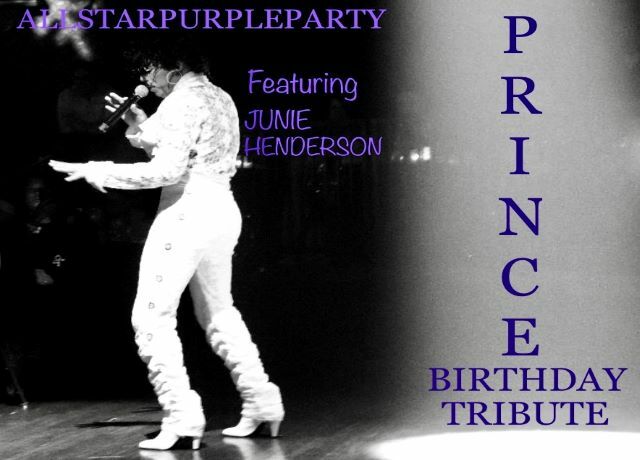 Henderson and his all-star band perform Prince’s most popular songs including “Purple Rain”, "Let’s Go Crazy”, “When Doves Cry”, “Kiss”, “1999”, “Little Red Corvette”, "Raspberry Beret”, “Pop Life”, “Sign Of The Times”, "I Wanna Be Your Lover” and many many more! Edward "Junie" Henderson is best known as an original member of the popular band E.U. (Experience Unlimited) who was the featured singer and songwriter on many of their songs including the classic #4 R&B hit "Taste of Your Love." With E.U., Henderson has performed on tour around the world, appeared in music videos on MTV and BET, and on national television shows including Arsenio Hall, Soul Train and Showtime At The Apollo. Backing Henderson is a talented all-star band featuring world-class musicians who have performed on international tours with legendary singers Aretha Franklin, Patti LaBelle and Wilson Pickett to name a few, and also performed on national television including The Tonight Show and Disney Channel.